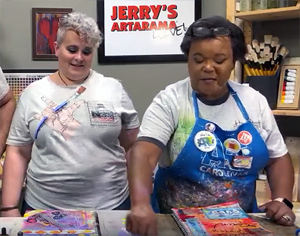 Episode 69: You’ve seen her on Mixed Media Mondays, and on our Jerrys Live show last year– the “Goddess of Getting Your Art Groove On”– Ophelia Staton! If you haven’t seen Ophelia, you are in for a real treat!!! Details Join us for this fun Mixed Media Madness where Ophelia makes Amy throw caution to…..